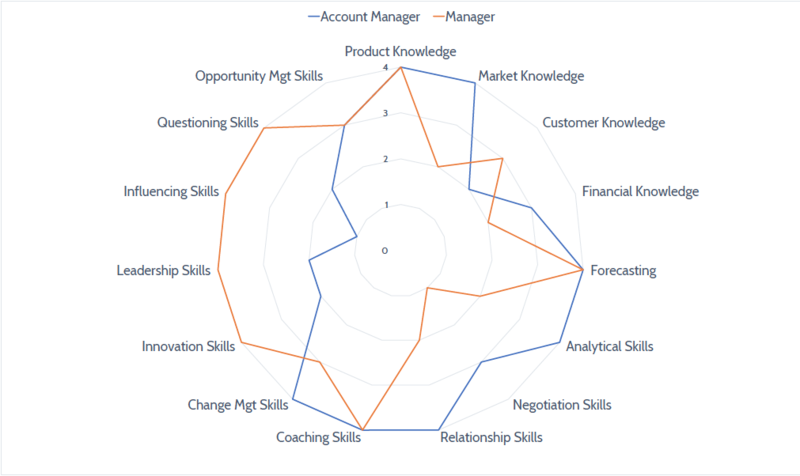 Prior to develop the competencies of your sales people you need to know what competencies your sales people have and which one are relevant for their sales role. Therefore we provide you with a blue print competency model for product sellers, value seller and value co-creators allowing you to quickly tailor it to your own organisation. The model is based on 15 individual commercial competencies. For each of these competencies we have identified four different behaviours, that of a Trainee, a Product Seller, a Value Seller and that of a Value Co-Creator. How to assess your sales force capabilities? Our 180 Degree Online Assessment Tool compares observed behaviours to those defined in your competency model and are carried out by the sales person and by their manager. The salesperson receives the assessment from their sales manager, which is compared with their own personal assessment. The tool provides a wide range of comprehensive reports allowing your to identify the current capabilities of both the sales people and the complete sales force. How to develop the needed capabilties? Our bootcamps and courses provide the obvious means to develop the competencies your sales people need. However, training alone is often not enough. Sales people do not do a good job because they have to, they do that because they want to. Our Sales Crafting workshops helps sales people to tweak their current role and responsibilities in a way that will fit better with their personal strengths and motives in order to increase their motivation.